The Short Version: Any number of adjectives could be used to describe THE LOST TRIBE, and those are anything but positive. The story has great potential, but zero characterization, half-baked plot devices and scuppered ideas of interest ensure this LOST TRIBE will remain forgotten for years to come. This stunningly retarded "monster" movie redefines horrible. The picture was originally shot in 2007 under the title of THE TRIBE and apparently saw release under various other titles overseas before being dumped on DVD this year. 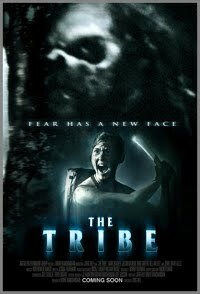 I recall seeing the trailer in the theater, but the years passed and no TRIBE. The preview looked quite good, but unfortunately, it's another case of the trailer being better than the actual movie; that's also an understatement. 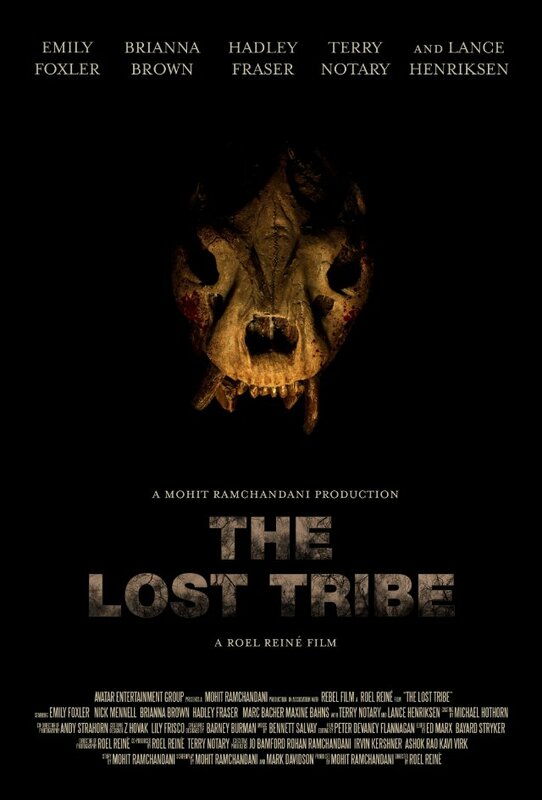 Rumors of an incredibly difficult actress (Jewel Staite from SERENITY) and a seriously hindered production kept THE TRIBE "lost" for some time. Reshoots were reportedly called for, but seemingly the entire cast couldn't be bothered to return. The film was started over from scratch (EXORCIST THE BEGINNING, anyone?) with an entirely new cast one of them being Lance Henriksen in what amounts to a slightly extended cameo as a murderous assassin of the cloth! Basically, a group of youngsters traveling overseas for some sort of internet business deal find a wounded man out in the ocean. Bringing him aboard, the crazed man later attempts to take control of the yacht and turn it in a different direction. The yacht ends up crashing on some rocks resulting in SyFy Channel worthy video game graphics. The survivors wash ashore on some mysterious island where they walk and walk and walk for what seems like hours. 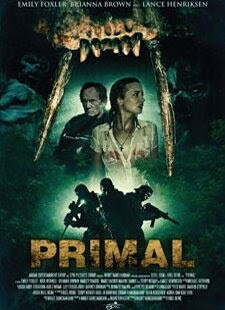 Up to this point, the movie resembles a discarded episode of LOST, but it turns into minor league horror once the group begins to drop like flies one by one (rather quickly I might add) being hunted by an unseen enemy of very agile ape-like monstrosities. 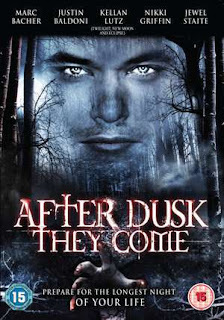 I began to wonder around the hour mark where the film was going once its now dwindled cast got down to its sole survivor. The result is even more walking/sneaking around (by Emily Foxler covered in booger juice from these grape looking fruits growing in the jungle) till the movie ends with a dumbfoundingly stupid brawl between the heroine and the lead beast man. Reminiscent of Deodato's LAST CANNIBAL WORLD, the ape creatures let the girl go and she gets into a small raft and heads out to sea. Although we never see them until late in the movie, the creatures vision is straight out of PREDATOR as is the means by which our boring leading lady evades attack from them (the aforementioned grape phlegm). The monsters themselves, a cannibalistic tribe of primitive man, the missing link, so to speak, wear head gear that also recall the creatures in PREDATOR. They also speak Klingonese. 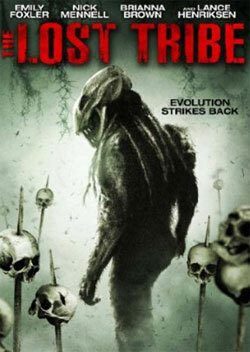 The film attempts some Darwinian styled meanderings regarding evolution, but squanders this sole interesting plot point in favor of the reshot films new leading lady (Emily Foxler) sneaking around the island avoiding the flesh eating monsters. The new footage reveals that the church found out about this missing link discovery after a first archaeological team went to the island, but disappeared under mysterious circumstances. Lance Henriksen and his Killers for Christ are sent in to wipe out the team, but only find one woman survivor and kill her when she proves uncooperative. Henriksen shows up one more time and after that, this portion of the script becomes more forgotten than one of this films numerous alternate titles. The original movie starts off in the early 1920s and flashes forward to the present day. This new version starts off with Henriksen and company on the island. Having only seen the first ten minutes of the original film online, I can't vouche for how good, or bad it is compared with this other version. I can only assume it's equally atrocious. The title card before the end credits is also one of the most bizarre things I've ever seen on any movies end credit crawl. 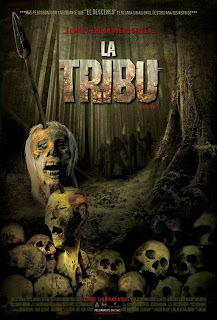 The gore is minimal, but decent with the addition of maggots covering freshly ripped open chest cavities and a couple other minor bits of mayhem. Awful on just about every level, THE LOST TRIBE does benefit from some excellent photographic shots of the island, but unless you're renting this for the exploitation of the exotic central location (which gets more mileage than anything else in this movie), I'd suggest you charter a new course and steer clear of THE LOST TRIBE. This review is representative of the Image Entertainment DVD. Thanks for saving me the trouble, I almost rented this one after an almost ok trailer on something I saw recently. Goinnnnnng to go ahead and pass. Yeah.. This was a HORRIBLE movie, Carl. I was waiting on it for the longest time after seeing the trailer, which looked fine to me. Then the film never came out. Apparently, the star, the lady from SERENITY disowned it and said in interviews it was the worst thing she ever did. I'm not sure if any of the original footage was used for the second version, or if it's all newly shot. The monsters in THE LOST TRIBE version look different from the way I remember them in the trailer from a few years ago. They could have put both versions on the same disc so you'd get twice the turd for your trouble.